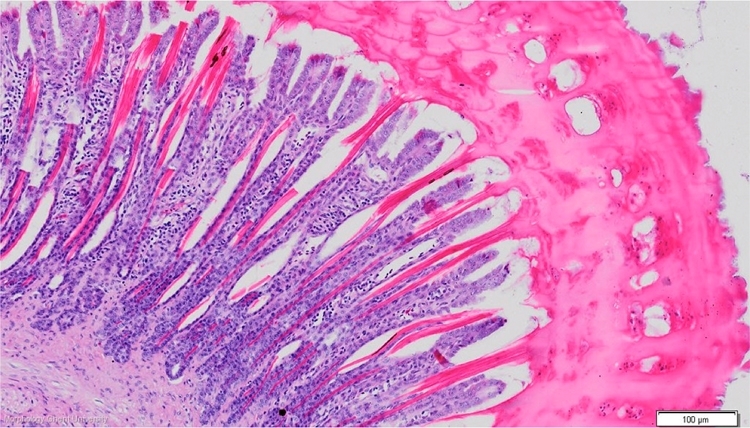 The lining epithelium invaginates into the lamina propria to form elongated pits which each end in several tubular gastric glands. The secretion of the gizzard glands forms the koilin (cuticula gastris), a thick horny layer of keratinoid nature that protects the wall and helps in digestion. There is no lamina muscularis mucosae. The T. submucosa is a rather thin layer of dense connective tissue underneath the propria without glands.